Priscilla Shirer is a wife and a mother first. But put a Bible in her hand and a message in her heart and you'll see why thousands flock to her conferences and dive into her Bible study series each year. Priscilla Evans was born 31 December 1974 in Dallas, Texas, the daughter of Dr Tony Evans, senior pastor of the thriving 9,500-member Oak Cliff Bible Fellowship. A graduate of Dallas Theological Seminary, Priscilla holds a Master's degree in Biblical Studies and loves nothing more than to serve her sisters in Christ through the teaching of God's Word. She considers it a privilege to serve believers from every denomination and culture by helping them to know the truths of Scripture intellectually and by encouraging them to experience these truths practically by the power of the Holy Spirit. Priscilla's ministry work began while she was still a college freshman. Her spots on Christian radio proved to be popular, and she was invited to lead the weekly Bible study at Zig Ziglar's corporation. In 1999, Priscilla married executive Jerry Shirer, and together they founded Going Beyond Ministries. In addition to Priscilla's participation in many church and para-church conferences across the globe each year, Going Beyond Ministries hosts AWAKEN - an outreach event in their hometown designed to encourage and mobilise women locally. This free gathering brings together thousands of women from different denominations and backgrounds several times a year for an opportunity to not only hear the Word but to live it out in practical ways. The ministry also equips believers with Bible study resources by partnering with LifeWay Christian resources. Priscilla has authored many video-based studies on biblical characters and topics including Jonah, Gideon, the Exodus, discerning God's voice and the Armor of God. Priscilla has published numerous books including Discerning the Voice of God, God is Able, the New York Times Bestseller The Resolution for Women, and Fervent: A Woman's Battle Plan for Serious, Specific and Strategic Prayer. In 2015, she made her debut as a screen actress, starring in the role of Elizabeth Jordan in the hit faith-based film War Room. Between studying and writing, Priscilla spends most of her time cleaning up after (and trying to satisfy the appetites of) her and Jerry's three growing sons - Jackson, Jerry Jr., and Jude. They make their home in Dallas. 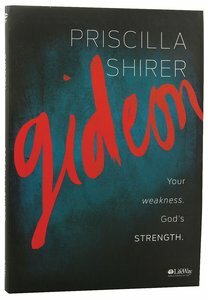 Customer Reviews For "Gideon: Your Weakness, God's Strength (Dvd Only Set)"
Priscilla Shirer takes you on a six week tour of the story of Gideon. Jam packed with great application, chanllenging questions and thought provoking material. Designed for groups, but I undertook this as a 'party of one' and thoroughly enjoyed it! I really enjoyed this teaching DVD series on Gideon. It is a 7 session study really looking at embracing our God-given strengths and how we can best respond to what God is calling us to do. Priscilla Shirer brings such passion and research to this Biblical character. I appreciated the detail and study that she had clearly gone to with this. I found her so easy to listen to as she is an extremely engaging speaker. I really felt it was a good investment of my time and I came away feeling like I really had a greater appreciation for Gideon after having done this study. I would highly recommend this resource. I absolutely loved this study on the book of Gideon. Priscilla seems to take a story of someone in the OT and not only brings it alive but pulls out principles that I need to hear and apply in my life today. The sessions are about 30-40 minutes each and so they are great for small group studies as they still leave plenty of time for discussion. But you don't need a small group to enjoy it. I got so much out of this study just working through it by myself.